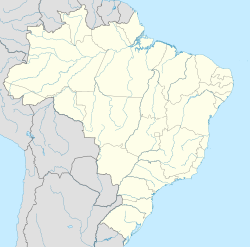 Amaturá is a municipality located in the Brazilian state of Amazonas. Its population was 8,694 (2008) and its area is 4,759 km². The municipality contains parts of the Jutaí-Solimões Ecological Station. ^ Brazilian Institute of Geography and Statistics - "IBGE - Cidades@". www.ibge.gov.br. Archived from the original on 11 June 2008. Retrieved 2008-06-15.